I used this shell in another blog post a few months back (here). I’ve had this since the kids were little and we used to vacation at the beach each summer. 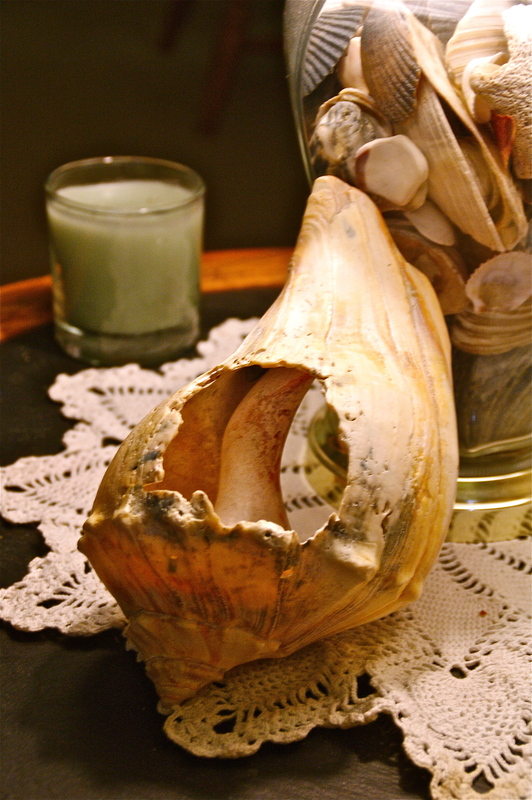 This conch is a perfect illustration of how beautiful “broken” can be. Life, too, breaks us at different times, but the breaks can be, if we choose and are willing to accept, the door to beauty and awe; newness. At any rate, I hope you check out the other post because it is one of my favorites. It really does express a lot of my philosophy. But if you are not interested (or have too many blogs to keep up with), ok. Glad you checked this one out! Have a marvelous, beautiful day! Did the camera I bought you for your graduation spark the interest in Photography? Please tell me how I know you. You are referring to years–decades–ago. Thanks for stopping by my blog. Much appreciated. Iv’e been reading A lot from your blog and I really dont think that there could possibly be another you. Think back to when you graduated from Valley. I gave you a camera for a graduation present. I was stationed at Fort Knox at the time. Remember now? KIT!!!! Yes! Now I remember! That was so long ago and many lifetimes away (it seems.) How are you? How did you even remember me? I’ll email you and we’ll find a better way to communicate! Talk about a blast from the past!!!!!! Thanks for stopping by! Yes, there are so many different types of photos for this challenge…quite interesting. Both of your ‘broken’ photos are beautiful–and interesting. Thanks faceinacrowd! Glad you think so. Beautiful shell, Cecilia. I enjoyed your other post as well. Just checked out the parable–beautiful; a wonderful reminder to pay attention. Thanks for sharing. Thanks Doris. I appreciate you dropping by. Hope you have a fantastic day! I would have expected a top to come off, or a large crack… but… hmm. Yes, you are correct, it is indeed a strange way for the shell to break. However it happened though, it is beautiful. Thanks for stopping by. As always, much appreciated. Cecelia the link back to the first post with the shell is beautiful. Beautifully written and I loved it. I think I will read it again 🙂 I am happy to have found your blog! Thank you for your sweet words! I am glad you found my blog, too, and I yours. 🙂 Have a wonderful day. Your blog is wonderful, the photo’s too. I wanted to thank you for stopping by my blog as well. This is so much fun! Yes Jackie, this is great fun! I enjoy my blogging buddies, of which I consider you one. Glad to hear that you are moved in to your new place. Hope it works well for you. Can some one please tell me what are pings and why do they happen? My impretion is that they are just computer generated and that they happen on their own? Yes and no. When someone links to my page, I automatically get notified that they have done so. When I accept their “trackback” or link, then whoever reads my page will be able to click on their link (usually in the comment section) and will be taken to their page. Trackbacks and pingbacks; wordpress tech support can explain it better than I can. I have begun to check the bottom right hand side of the right collumn on the page where I compose new posts. There you will find suggested links that tie in with the subject matter you are writing about. If you want to add the links to your post (i usually try to add a few) then click on them. That is one way to get more traffic and to support each others’ blogs. Now that I have thoroughly confused the matter, just contact tech support. Good luck. I have gotten atleast 3 pingbacks from the last WordPress photo challenge which was titled “Broken”. The people that pinged back to me were not familiar with me in any way that I know of we all just had something in common in that we all posted a picture for the “broken” photo challenge. hmmmm. . . You’ll have to ask teh support. I can’t answer that one. Hi Jessica, I did a pingback to your site from my “broken” challenge post because I wanted my readers to see your “broken” post. I saw your post as a “related article” and clicked it to add as a pingback just as Cecelia described above (but my recommendation area is underneath my text writing area. you can rearrange the layout to suite your needs) Hope this helps. I used to collect shells but when I went to the city to study and work, I stopped and the box that contain those shells was thrown in the garbage bin by my mother 5 years ago. I was reminded of how beautiful shells are because of your post. Thanks Sony. Shells are beautiful, I agree. Hope your day is beautiful, too. Oh, wow. Alot of people did that for me then. I did not realize that that was what was going on. Thank you for explaining. How do you do a pingback? The way I understand it is that when I add someone’s link to my post, that is a trackback. The person on the recieving end gets a pingback. It’s really wierd, and the teminology makes me crazy. What happens is that when I add someone’s link to my page, they will automatically recieve a link on their page back to mine. By helping send traffic to them, they are helping to send traffic to me. Hope that isn’t too confusing. Hmm. Guess I will have to try it some time. Thank you. How many times have we been reminded of the importance of “breaking out of our shells?” Fabulous photo and I look fwd to reading the original post! Wow Patti! Another post 🙂 I’ve written many articles about brokenness and being broken to create something new, but I never thought about breaking out of our shells! Thanks. That shell has been with me for years, and I continually find new ways of viewing it. You have just offered another. Have a great day.